One of the advantages of building something yourself is that if you’re not happy with it you can tweak, change, modify and adapt until you are. But one of the disadvantages is that sometimes you get so caught up in all the tweaking, changing and adapting that you overlook a much simpler solution. 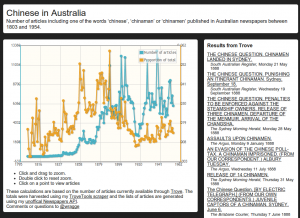 So I had a harvester that could save the publication details and content of all the newspaper articles in a search on Trove. But the warm glow of self-satisfaction quickly began to fade as I started to think about how I wanted to use the content I was harvesting. The harvester saved the text of articles organised in directories by newspaper title. This seemed to make sense. It meant that you could easily analyse and compare the content of different newspapers. But what if you wanted to examine changes over time? In that case it’d be much easier if the articles were organised by year — then I could just pull out the a folder from a particular year, feed it to VoyeurTools, and start tracking the trends. There ensued some minor tinkering. As a result, you can now you can pass an additional option to the harvest script, telling it whether to save the article texts and pdfs in directories by year or newspaper. Simply set the ‘zip-directory-structure’ option in harvest.ini to either ‘title’ or ‘year’. If you’re using the command-line you can use the ‘-d’ flag to set your preference. Easy. But that set me wondering whether it might be possible to generate an overview, showing the number of articles matching a search over time. So I started on a modification of my harvest script that did just that — cycling through the search results, adding up the numbers. It wasn’t until I ran the new script for the first time that I realised there was a much simpler alternative. So instead of sending hundreds or perhaps thousands of requests to Trove, all I needed was one for each year. From there it was easy and soon I had my first graph. I was pretty pleased with that, but of course the raw numbers of articles on their own are rather misleading. 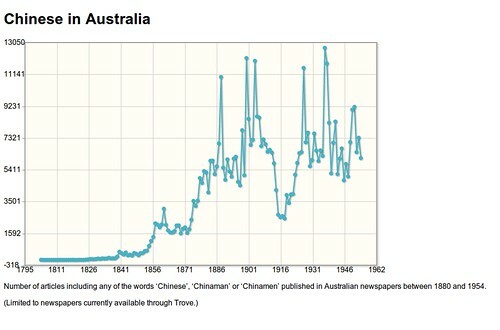 The more interesting question was what proportion of the total number of articles for that year the search represents. Another quick tweak and I was grabbing the overall totals and calculating the proportions. At this point I invited my Twitter followers to suggest some possible topics — you can see the results on Flickr. But what do the peaks and troughs represent? I wanted to use the graphs as a way of exploring the content itself. This was possible as I’d saved the data as JSON and used jqPlot to create the graphs in an ordinary HTML page. Courtesy of some clever hooks in the backend of jqPlot I could capture the value of any point as it was clicked. That gave me the year, so all I had to do was combine this with the search keyword values and send off a request to Trove. So now instead of just looking at the graphs, you could explore them. I’ve created a little gallery of graphs to explore. I’m still open to suggestions! What you’re doing with TROVE is very similar to what we’d like to be doing. We are running a citizen science program called OzDocs, where people help extract climate histroy information from sources like TROVE. So sometimes we need to pull out bulk images or text to hand over to volunteers to sort through. Your Harvester looks good for that but I have a bit of a problem with one task that we are working on and was wondering if you had any ideas. 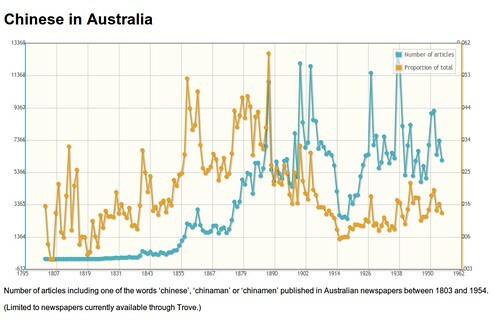 We want to digitise all the pressure table published in the Argus in 1850s. However when we do a key word search we get less than 50% of what is really there. I guess that is because of OCR. Is there a way we could select dates or dates ranges and just pull the best quality image possible of page 2 of every edition within that range? All of this would be easily scriptable. You’d just need to feed your script the years to harvest and it would grab all the relevant pdfs for you. discontents - When did the ‘Great War’ become the ‘First World War’?